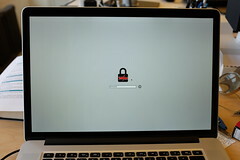 Thunderstrike is the name for a class of Apple EFI firmware security vulnerabilities that allow malicious software or Thunderbolt devices to flash untrusted code to the boot ROM and propagate via shared devices. It was presented at 31C3. You can read an annotated version of the presentation or watch the hour long video. The FAQ answers common questions and I've also cataloged appearances in the media. 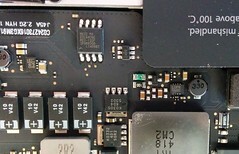 There is now a no-hardware-required variant, Thunderstrike 2, which was presented at DefCon 23 / Blackhat 2015. In this presentation we demonstrate the installation of persistent firmware modifications into the EFI boot ROM of Apple's popular MacBooks. The bootkit can be easily installed by an evil-maid via the externally accessible Thunderbolt ports and can survive reinstallation of OSX as well as hard drive replacements. 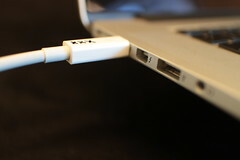 Once installed, it can prevent software attempts to remove it and could spread virally across air-gaps by infecting additional Thunderbolt devices. It is possible to use a Thunderbolt Option ROM to circumvent the cryptographic signature checks in Apple's EFI firmware update routines. This allows an attacker with physical access to the machine to write untrusted code to the SPI flash ROM on the motherboard and creates a new class of firmware bootkits for the MacBook systems. Our proof of concept bootkit also replaces Apple's public RSA key in the ROM and prevents software attempts to replace it that are not signed by the attacker's private key. Since the boot ROM is independent of the operating system, reinstallation of OS X will not remove it. Nor does it depend on anything stored on the disk, so replacing the harddrive has no effect. A hardware in-system-programming device is the only way to restore the stock firmware. While the two year old Thunderbolt Option ROM vulnerability that this attack uses can be closed with a few byte patch to the firmware, the larger issue of Apple's EFI firmware security and secure booting without trusted hardware is more difficult to fix. 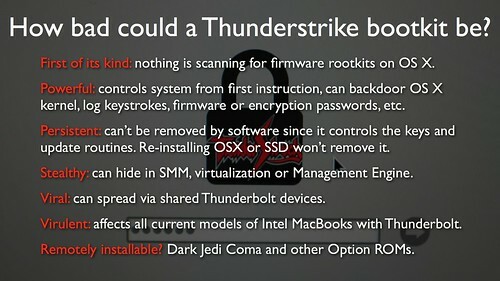 The Thunderstrike FAQ page has more detailed questions. 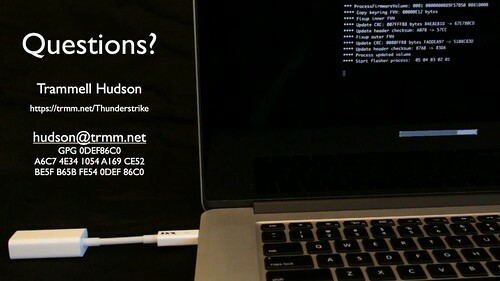 If your question isn't answered there, send email to hudson@trmm.net, preferably with PGP and I'll do my best to add an answer to your questions to the FAQ. Media discussion of Thunderstrike has been moved to its own page. Articles flagged with ★ are ones that have good technical discussion. This page was last edited on 11 August 2015, at 14:08.